Perhaps no guard improved their stock more in Lexington than Andrew Jones. The Pro Skills product put everything together in session two, playing extremely effective defense while posting impressive scoring averages. His defense and athleticism really sets his game apart, and the Pro Skills’ pressure defense plays right into his style. A couple more sessions like this, and Jones will become a household name among people in the know. Check out Andrew's player page. That sound you hear is Trae Young completely blowing up. MOKAN’s sophomore star started the session out with a bang, recording back-to-back 29-point performances. In four games, he averaged 20.8 points, while establishing himself as one of the best true scorers in the 2017 class. He doesn’t play like an underclassman, and his stock should continue to soar after being offered by Kansas. Check out Trae's player page. Bolden found himself in quick foul trouble against Team Takeover, and that lit a fuse under the big man. Bolden rebounded from that performance to average 16.6 points and 7.7 rebounds in the final three games. Perhaps more than any other player, Bolden’s effective does not always show up in the stat sheet. He impacts countless shots on the defensive end, and ultimately makes teams re-think their strategy in the paint. If Bolden performs like this, consider Pro Skills to be a top contender to take home the regular season title. Check out Marques' player page. The only thing keeping Walker off the first or second team is wins. He has comparable numbers to the league’s best, and we consider him to be one of the best combo guards in the league. In four tough matchups, the recently de-committed (Purdue) guard shot 50% from the floor en route to averaging 20.8 points per game. Indy Heat will need this production to continue – or improve – to rally for a Peach Jam berth. Check out CJ's player page. It took him a session, but the basketball world finally got to see what Tucker was capable of while playing against the nation’s best competition. The 6-foot-8 sophomore impressed on both ends, averaging 16 points per game including a 24-point performance in a win over Playground. He’ll be in the EYBL for at least six more sessions, and we don’t expect him to be a stranger to this list. Check out Jordan's player page. The Georgia Stars frontcourt gets a lot of hype, but Forrest and his backcourt mates are vital to their success. Forrest played within himself in Lexington, averaged 15 points while leading the Stars to a 3-1 record. It would be a surprise if he didn’t crack the all-tournament teams by season’s end. Check out Trent's player page. Jalen Dupree made his debut with Team Penny this weekend, averaging 10.3 points and 9.3 rebounds. Penny drastically needed help in the frontcourt, and Dupree delivered. Check out Jalen's player page. Igbanu is one of the few bright spots for the Stampede, assuming the role Derek Ogbeide’s took in 2014. The big man had a great four games, averaging 13 points and 7.5 rebounds while playing lockdown defense in the paint. Check out Martins' player page. Washington made his 2015 debut for Team Penny, bruising his way to four game averages of 14.5 points, 7.5 rebounds and over a block per game. His production will be crucial for Penny’s chances over the next two sessions. Check out PJ's player page. 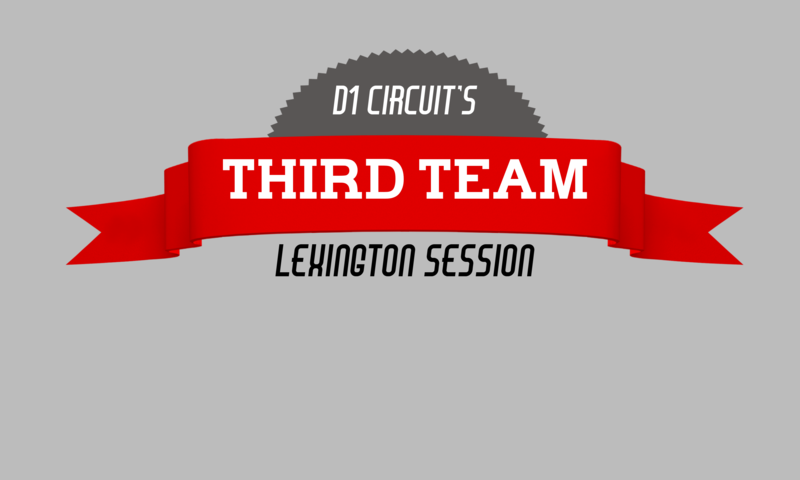 Cumberland made his way over from Ohio Basketball Club and earned himself Lexington’s Breakout Performer. He adds a much-needed scoring kick for an underrated King James squad and should continue to put up impressive numbers. Check out Jarron's player page. Ponds was terrific for the second straight session, averaging 17.3 points for the up-tempo Lightning. He plays within himself and doesn’t make too many mistakes, turning himself into the Lightning’s most dependable scorer in the backcourt. Check out Shamorie's player page. Trent Jr. enjoyed himself his second EYBL session, averaging 20.5 points through four games. He erupted for 36 points versus Team Texas, and a loss in that game is the only thing keeping Trent Jr. top the top three teams. Check out Gary's player page. Boo Williams struggled in Lexington, but Jones certainly did not. The Huntington Prep product averaged 20.8 points per game during the second session, picking up new interest from North Carolina. Check out Curtis' player page.